A lot of computer users will know that when you delete a file, it isn’t actually completely gone from the system and can often be recovered with a simple piece of data recovery software. This fact is especially important if you are giving away or selling an old computer system / hard drive, or just letting someone borrow an external hard drive or even USB stick because the other user could easily recover data you thought was gone, posing a major security risk. Even a format and reinstall of the operating system in that situation still doesn’t mean all the old data is completely safe from being recovered by others. The same thing applies to external storage media like USB sticks or memory cards, and these are perhaps more important as they are far more likely to change hands than internal devices. What you can do is make sure that before a hard drive, SSD or USB stick goes to somebody else, temporarily or permanently, any data that you don’t ever want to be read by others or recovered from these devices gets wiped clean and cannot be retrieved. One way is to wipe the free space on the drive meaning only those files currently visible can be viewed. Another way is to completely wipe the drive or partition clean so no data at all is left on it and nothing at all can be recovered. Here’s a selection of tools that can perform this task and wipe a hard drive clean making it more secure before it leaves your possession. DBAN is a very well known and respected data wiping tool that runs from a bootable disc and is great for when you want to sanitize more than a single drive or system drive because it can automatically erase all found partitions. Burn the ISO to CD or create a bootable USB stick and boot to DBAN. Press Enter at the prompt to be taken to interactive mode where you choose your settings. If you type autonuke at the prompt, IT WILL ERASE ALL DRIVES WITHOUT CONFIRMATION, so is something you should be very careful with. In interactive mode you can change the PRNG (Pseudo Random Number Generator) type, the number of rounds to perform each method and the type of wiping method used. There are 6 to choose from ranging from a basic zero fill, to the default 3 pass DOD Short, DOD standard (7 pass), RCMP (8 pass), Gutmann (35 pass) and the recommended PRNG random data fill which the number of passes is determined by the rounds set. DBAN is a powerful tool but could also be dangerous in inexperienced hands, use with care. 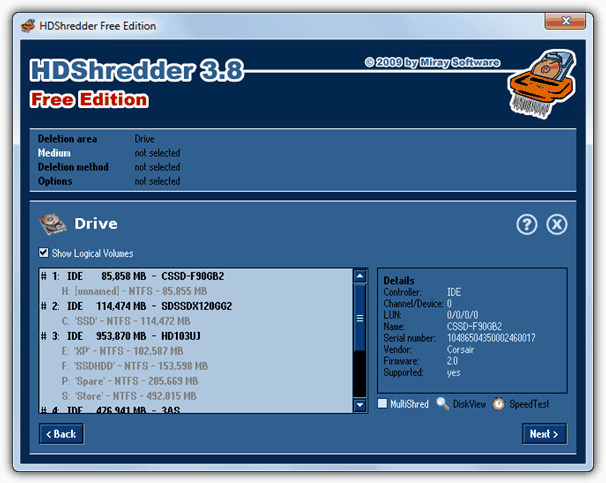 The free version of HDShredder is quite limited in functions compared to the paid versions, but can still perform a 1 pass erase on whole hard drives (not partitions). It doesn’t make clear though whether it is a 0 fill or random fill type of method used in the single pass so maybe is not the software to choose if the drive is going to somebody you don’t know. The good news is the program comes in a portable Windows executable, an IMG floppy image and also an ISO CD/USB image all included in the zip file so you have multiple ways to get the erasing done. A hex viewer is available to inspect the drive for data and multiple drives can be selected at once using the MultiShred tick box. The Windows program works on XP and above. Parted Magic with GParted is one of the best Linux bootable CD environments around today for partitioning and erasing hard drives and is also recommended by companies like Corsair for erasing SSD’s. Simply download the Parted Magic ISO and write it to CD or USB and boot from it. These days the Disk Eraser icon is on the desktop, but if yours isn’t it’s found in the Start menu -> System Tools. In the main window will be options to zero the MBR, drive or partition using different methods, and for multi pass options there’s the NWipe tool which is actually a fork from and very similar to Darik’s wiping tool in DBAN. 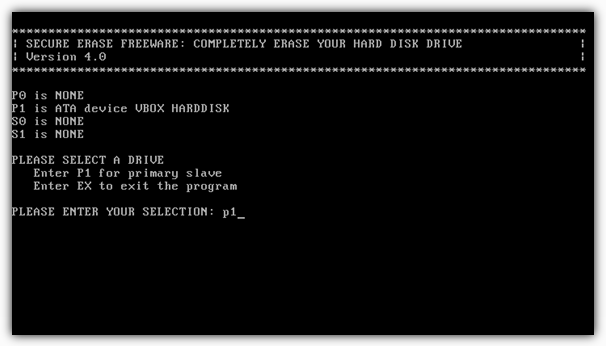 The Internal Secure Erase method is the most important because it issues the ATA erase command found in the firmware of nearly all drives since 2001. This is more secure than overwriting with 0’s, 1’s or random data using 3rd party tools and is the recommended way to wipe a hard drive or SSD if your drive supports it. Parted Magic is also found on the Hiren’s Boot CD repair disc. HDDErase was developed by The Center for Magnetic Recording Research (CMRR) and originally sponsored by the National Security Agency. This tool works exclusively by issuing the ATA Secure Erase Command which is a preferred method for SSD’s and HDD’s made since 2001 (bigger than 15GB), and is DOS based meaning it needs to be run from a floppy, CD or bootable USB stick. The ISO can be burned straight out and includes the HDDErase executable or you can manually copy the file to your own DOS distro. Boot the disc and at the prompt type hdderase, this will start the process and all you need to do is select your drive and follow the prompts to secure erase it. If your drive supports it there may also be an option to perform an Enhanced Secure Erase which will write set patterns instead of zero’s to the drive. Because the erase is performed within the drive itself, this method is considered more secure and thorough than overwriting with a 3rd party utility. HDDErase is also present on the Ultimate Boot CD and Hiren’s Boot CD repair discs. Thanks for your article but I need additional help please. I have a Dell Latitude E5530 and I want to prevent deleted files from being recovered. I want to keep existing files. What is the best software for that purpose please? Thanks. I have used Unistal’s data wipe software which wipes the data from the hard drive so that it can never be recovered from any software. Thanks for the useful information Raymond And HAL9000. Today I read your column and it’s really very nice in order for us users to protect our privacy. Nice post Mr. Ray. Thank you very much and more power in this blog. Only this week i discovered your blog, and i do enjoy reading it. I’m surfing through every page, from your first page. thanks for the post…really very useful…. saw the thing in action…..